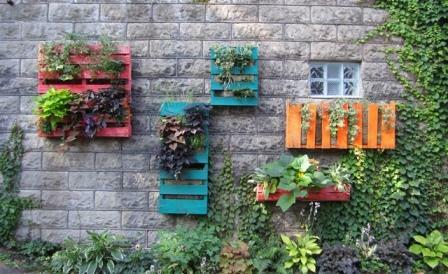 Recycling pallets as vertical gardens make great screens, conversation pieces and cool art for the outdoors! First things first you need a good pallet. 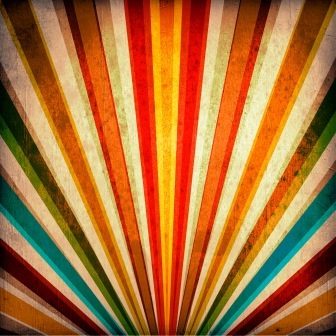 Many can be found at big box stores or local grocers or appliance stores. Ask before taking, just because it is sitting by the dumpster does not mean it is not in use. If you're making an edible garden, please be sure to check the pallet content. I suggest visiting this article: http://www.treehugger.com/sustainable-product-design/how-to-tell-if-your-pallet-is-safe-to-reuse-pallet-safety-info.html from Treehugger.com for what to look for in a pallet. Now we have a good pallet for our project we are ready for the rest of our supplies. You will need 2 large bags of potting soil, the equivalent of 16 six packs of annuals, herbs, etc., 1 roll of landscape fabric, a staple gun with staples and sand paper. Step two is to clean up your pallet. Secure any loose boards, remove loose nails, and sand bad corners or rough spots.Step three, wrap it up! First decide which side of your pallet will be the back when the pallet is finished and leaning up against a wall, fence, or is attached to a structure. You will cover the back, bottom, and sides with the landscape fabric. The easiest way to do this is put your pallet face down on the ground and roll out your landscape fabric over the back. Be sure to wrap all the way around the bottom and leave extra to fold under. Starting on one side, fold under your edge about one inch and start stapling across. Once one side is complete, pull taunt and do the opposite side the same way. Once that is done, go back and secure all the sides so that the structure is completely covered and secure. Remember to also cover all the spines with staples (the slats along and across). You are making one-sided pockets to plant in and you will not want potting mix or your plants shifting in the spaces. Step four, planter up! It is recommended to bring your pallet to its final destination place before planting unless you have a pallet jack to move her after you fill it. You will want to plant flat on the ground for ease. First plant the top making sure all your plants are snug tight. Now you can pour your potting soil over and into all the slatted areas making trenches as you go. You will want to plant six plants per slatted section (you will have two across - so 12 plants total across). Make snug with soil and work your way down with another trench, and so on. Once complete, the entire pallet front should be packed firm with plants so no soil is exposed and all soil is firmly packed into all areas not showing. Final step, patience! You will want to leave your pallet down flat for a couple of weeks, watering as needed to ensure the roots develop and imbed the plants in place. Then set upright and enjoy your vertical garden! Want to take Vertical Gardening further check out this Gutter Garden from Lowe's.